The SWSC Championship is slated to start on Wednesday at Bolingbrook High School. However, the throwing area could not accommodate John Meyer assaults. It is reportedly measured to maximize to 62-feet. That distance is shorter than Meyer's warm-up tosses. So, the throwing venue was held Tuesday at the cozy confines of Lockport HS. "The Bolingbrook shot area stops at 62'", said throws coach Walt Shields. "After that drops off 6' and big electrical box behind. John hit 62' barrier as a soph and almost hit electrical box on a foul." But the big news was the all-time record indoors or outside being set by Meyer. 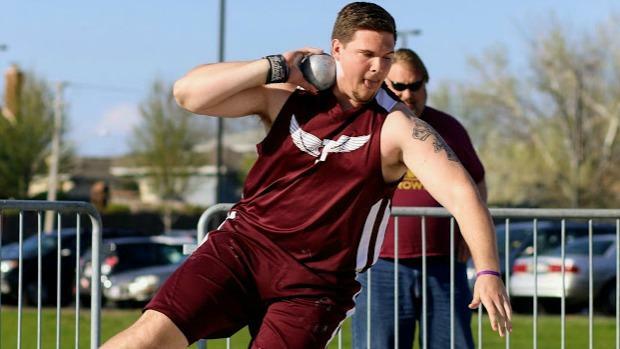 He becomes the first Illinois boys to toss the shot put over 70-feet with a meteoric 70'6.5". In the process, Meyer grabs the US#1 spot away from Tyson Jones of Desert Edge, AZ who threw a best of 70-4.5. "He has had some issues with our outdoor shots being a little too slick causing his release to be inconsistent. He doesn't seem to have that issue with our 6k shot which is rougher and a little bigger. I ordered him a new Velaasa shot which is supposed to be a little rougher and hold chalk better. I am hoping he likes this shot and will get more consistent releases!"